After a break of one month, Morrissey and his band traveled to Japan, New Zealand and Australia. This was a first for Morrissey, The Smiths had never traveled that far. 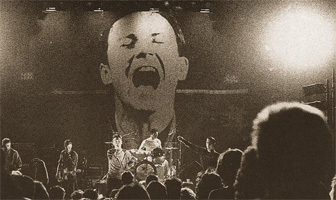 Concerts in Sydney, Melbourne, Adelaide and Perth scheduled at the tail end of this tour were cancelled after Morrissey fell ill with viral flu which developed into sinusitis the next day. He didn't leave his room for four days. The tradition of throwing cigarettes to Morrissey during "Our Frank" (because of the line "give me a cigarette") held strong in Japan. 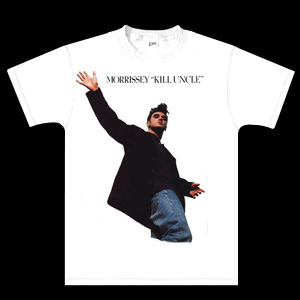 Morrissey often picked one up and put it behind his ear or pretended to smoke it. Morrissey friend Linder Sterling followed Morrissey to Japan to resume her photographic safari that would lead to the publication of her "Morrissey Shot" book. Photographer Kevin Cummins was also present in Nagoya. His photos were first published in the 19 October issue of the NME, and later collected in his "The Smiths And Beyond" anthology. It is very likely that there were no support for the Japanese dates. In New Zealand, the opening act was a string quartet of members of the Wellington Regional Orchestra. Information is needed for Brisbane. 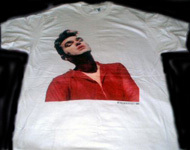 - White t-shirt showing a beefcake Morrissey as later used on the "Live In Dallas" video. 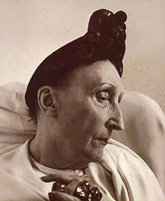 - Tour programme showing Edith Sitwell on the cover. Inside: tour dates and a "Our Phranc" 3 page feature; £5 (view). - A few more posters were sold, perhaps the football one (view; bigger image needed). - There were also Japanese cds and videos for sale in Japan along with a set of three postcards forming a sort of jigsaw version of the cover photo for the "Pregnant For The Last Time" single. Unknown. Morrissey and his band entered stage after Klaus Nomi's "Wayward Sisters". The audience left the venue to Shirley Bassey's "Ave Maria". 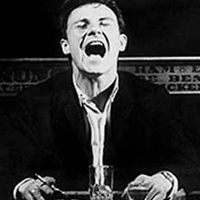 The Harvey Keitel backdrop (view original and in situ) was usually used during the main set and the Edith Sitwell one (view original and in situ) during the encore. The average setlist length was of 19 songs. The lucky Japanese fans attending the first night in Fukuoka were treated to 20 tracks while only 18 songs were performed in Auckland in New Zealand. Every night, Morrissey significantly changed the setlist order. 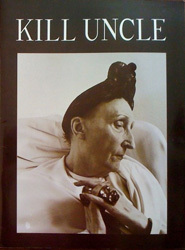 The most notable addition to the setlist for this portion of the Kill Uncle tour was "Sister I'm A Poet" which had only been performed once before, in Wolverhampton in 1988. 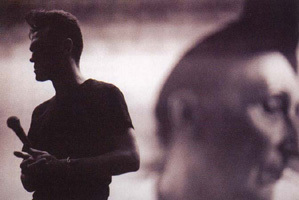 The backbone of the setlist was made up of these 16 tracks: "Mute Witness", "King Leer", "Asian Rut", "Sing Your Life" and "Our Frank" from "Kill Uncle"; early singles "Interesting Drug", "The Last Of The Famous International Playboys", "Piccadilly Palare", "Everyday Is Like Sunday", "November Spawned A Monster" and "Suedehead"; "Viva Hate" album tracks "Angel, Angel, Down We Go Together" and "Alsatian Cousin" as well as b-sides "The Loop", "That's Entertainment" and "Disappointed". The latter served as standard closer. The sets were rounded up with part-timers "Sister I'm A Poet", newest single "Pregnant For The Last Time", "Will Never Marry", the yet-to-be-released "I've Changed My Plea To Guilty", "Yes I Am Blind", "There Is A Place In Hell For Me And My Friends", the cover of the New York Dolls' "Trash" and the cover of T-Rex's "Cosmic Dancer". In "The Last Of The Famous International Playboys", Morrissey constantly sang "just to make myself attracted to you" and occasionally reversed Reggie and Ronnie Kray's names. In "Sing Your Life", he sometimes changed a few lines to the more personal "I have a lovely singing voice" and "They stole the notion from me" or sang "All the things you love, all the things you don't love" instead of "All the things you love, all the things you loathe". In most performances of "Everyday Is Like Sunday" Morrissey made just two of the usual changes: "scratch on a postcard" and "please come, please come nuclear bomb". On one or very few occasions, he also sang "I do believe this is the coastal town". In "Pregnant For The Last Time", the line "If ever we had the nerve to" was changed to "If ever we had the chance to" and "And people being nice for the very first time" to "...the very last time". At the end of "Sister I'm A Poet", Morrissey changed a line to "A plastic bag stranded at the lights, this once was me". "Piccadilly Palare" was often followed by Morrissey's cover of the New York Dolls "Trash", when the latter was in the setlist. At the end of "That's Entertainment", the band broke into a frantic drum and guitar frenzy not in the studio version. The line "it's safer to be inside" in "I've Changed My Plea To Guilty" was changed to "it's safer to stay inside", which is closer to how the song was written, but not recorded. In "Disappointed", Morrissey usually changed the line "Young girl one day you will be old" to "Young girl one day I really will be old" and finished that song by repeating something like "ah yes! ah yes! ", or moaned, instead of singing "No I've changed my mind again". A video recording of the full Wellington set is circulated among collectors. The filming was done from the left balcony and the footage is clear and steady. All the concerts from this section bar the first and the last two ones are available on bootleg CDs at this point in time. The best option has to be the manufactured cd bootleg "Nothing To Declare But My Jeans", produced from the Osaka concert. It features a rather good audience recording of the full concert and is widely spread on the usual file sharing networks. It is the only date of this section where "I've Changed My Plea To Guilty" was performed. A close second would have to be the manufactured bootleg cd "That's New Entertainment", produced from the Tokyo concert. It features a fair-to-good audience recording of the full concert, including "Trash" which wasn't played anywhere else on this leg (but many times on earlier legs). Untitled fanmade CD-Rs and digital files are also circulated for the Nagoya, Yokohama and Wellington concerts. These are of similar quality, but they vary sensibly in content. Nagoya is probably the one that stands out of the three, it is the only place on this leg where "There's A Place In Hell For Me And My Friends" was performed. Any particular memories of last time you played in New Zealand all of 21 years ago? "Yes, all good. I lost my passport, I contracted Asian Flu, I then went on to Australia where I spent 7 days under hospital supervision awaiting a blood transfusion. But the audiences were great."